What is a renewal notice? A renewal notice is defined as a document or a letter that tells you about a certain agreement or contract that is about to end. A renewal notice is usually sent via mail, email, or together with your billing statements to give you details about the agreement or contract that is about to end and provide you options whether you want to renew it or not. 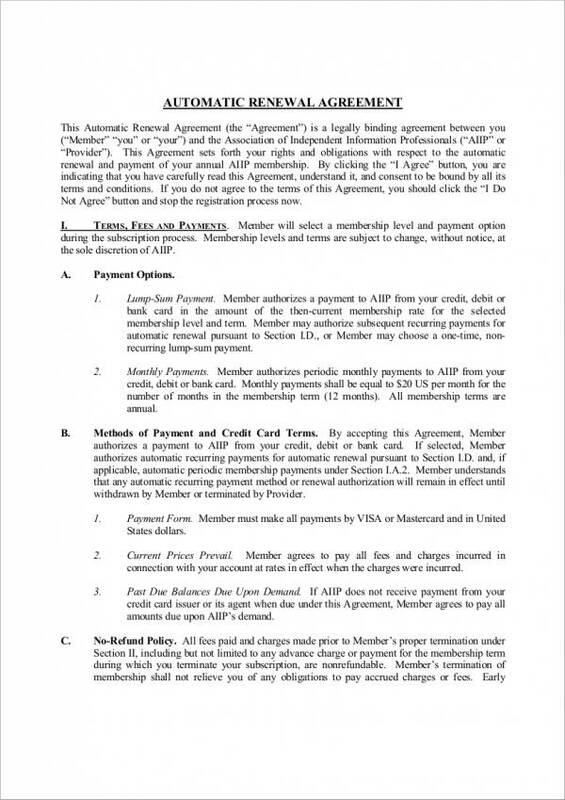 The information provided in the notice could be about a service agreement or a business-related contract, that is why it is important to take note of the details provided in it. The same thing is true with creating renewal notices and other notices, like that of a two weeks notice or an eviction notice. Because of its importance, it should be written carefully and in detail. 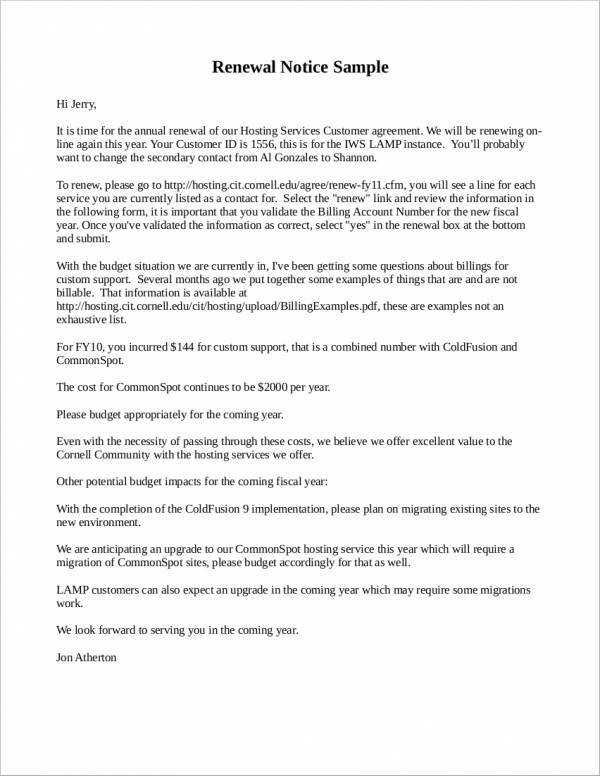 To further your understanding and knowledge about renewal notices, we present to you useful renewal notice letters and samples in PDF. These samples are available for free download. Check them out below! 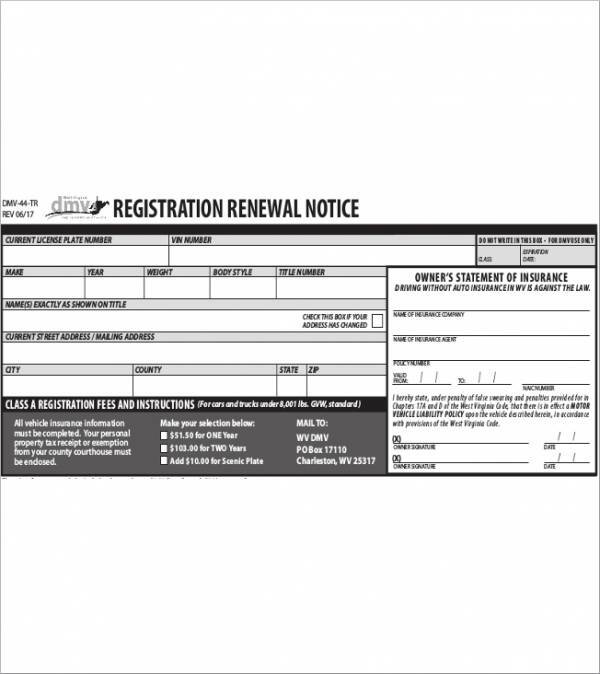 What Are the Uses of a Renewal Notice? Renewal notices exist because they are proven to be useful. 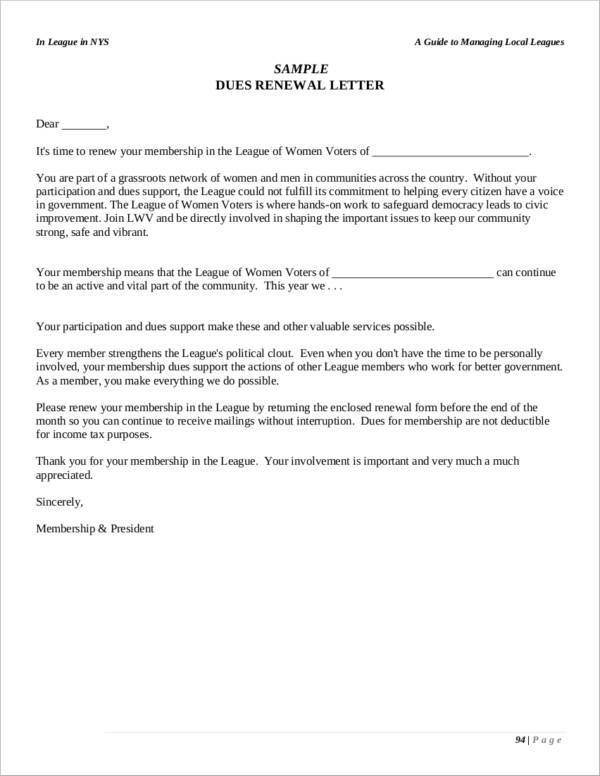 It’s not just your typical document or your ordinary piece of paper. It is something with sense and with a purpose. 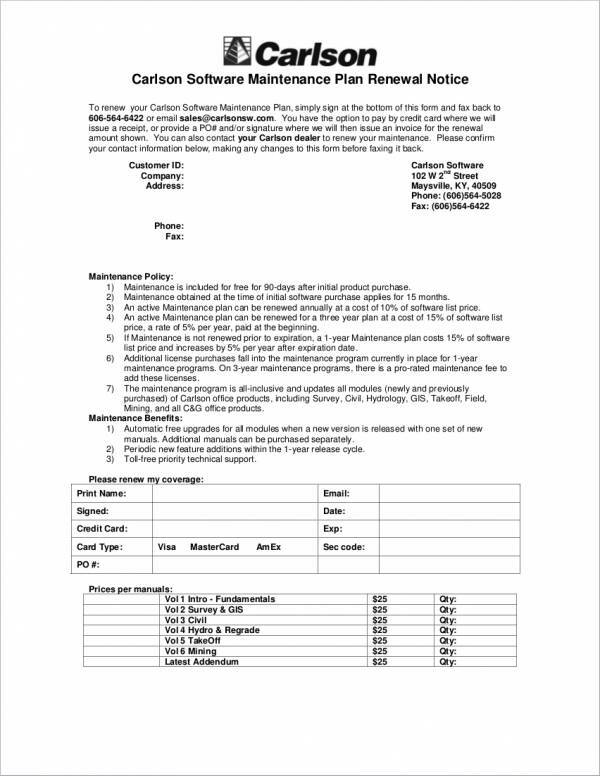 To be able to tell you about its uses, we have made a list of the well-known uses of a renewal notice form below. It is used to give information. If you have read a renewal notice before or just about any forms of payment notice, you will know that it is full of information. In the first place, its purpose is to relay a message from one entity to another in order for the other entity to know about what the sending entity knows. It is used to provide options. When a renewal notice is sent, the sender ensures that it contains options that you can choose from whether you want to renew and continue a service or a partnership. If you want it to end, then you will be provided with steps to be able to do so. 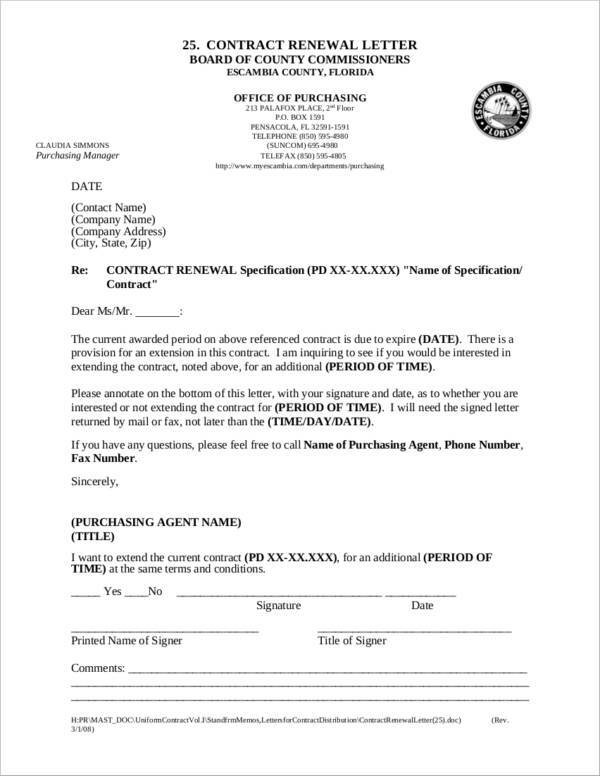 A renewal notice will only tell you that it will renew automatically if you have agreed to these conditions before you signed any contracts or sample agreements. It is used to provide clear step-by-step instructions. Renewal notices will always tell you how to continue or how to discontinue a service agreement or a particular agreement. It will often say to leave it as it is if you want to continue the service, or call this number to discontinue the service and stop it from renewing. Those instructions should be fairly easy to follow. It serves as a notification or reminders. A renewal notification reminds you that a particular service is about to renew, that way you will have sufficient time to decide if you want to renew it or not. It would be troublesome if you forget about such things, right? With a lot of things you have to do, it’s a miracle if you remember this detail without a meeting notice. It is sent to allow enough time to make a decision. That’s right. All of us need enough or sufficient time to make proper and worthwhile decisions. And a renewal notice is used to give you that luxury of time. It is used to outline all the necessary requirement documents needed for the renewal. With a renewal notice, you don’t have to inquire or call about what you need to do or provide to renew because it’s already provided in the notice that is sent to you. It’s that convenient. Can ensure that all regulations of transactions are updated. A renewal notice ensures that you are not left behind about updates and changes needed for your account to renew. To provide cohesion to the agreement that can benefit the parties involved in the transaction. How Often Should You Receive a Renewal Notice? There is generally no fixed schedule or time on how often you should receive a renewal notice. The date or schedule for receiving renewal notices varies depending on what type of service or agreement needs to be renewed. There are renewal notices that are sent every month, usually with services such as cable television services, Internet services, landline and postpaid phone services. Others are beings sent every quarter, biannually, and annually, and these are often with vehicle registration renewal notices, insurance renewal notices, or lease renewal notices. 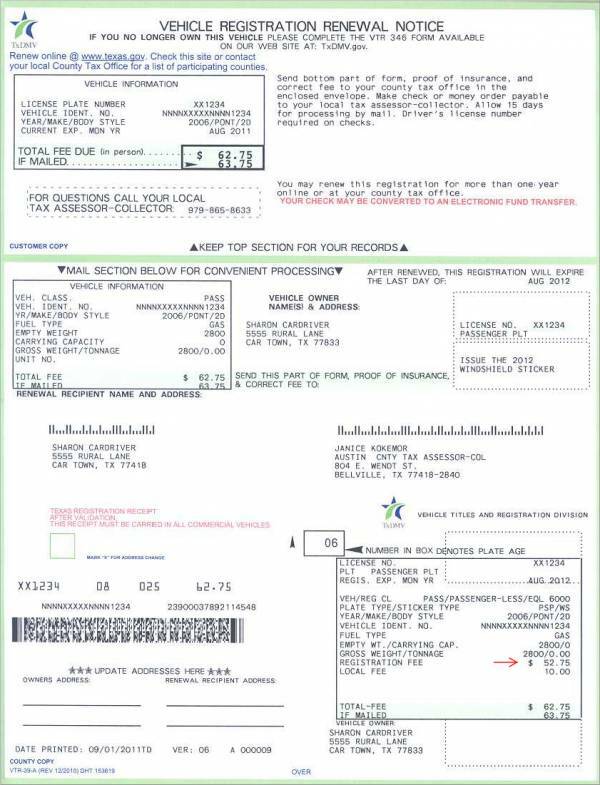 Always remember that not all renewal notices are the same. That is why it is best that you have knowledge about renewal notices in general to keep you on track with what it is all about. 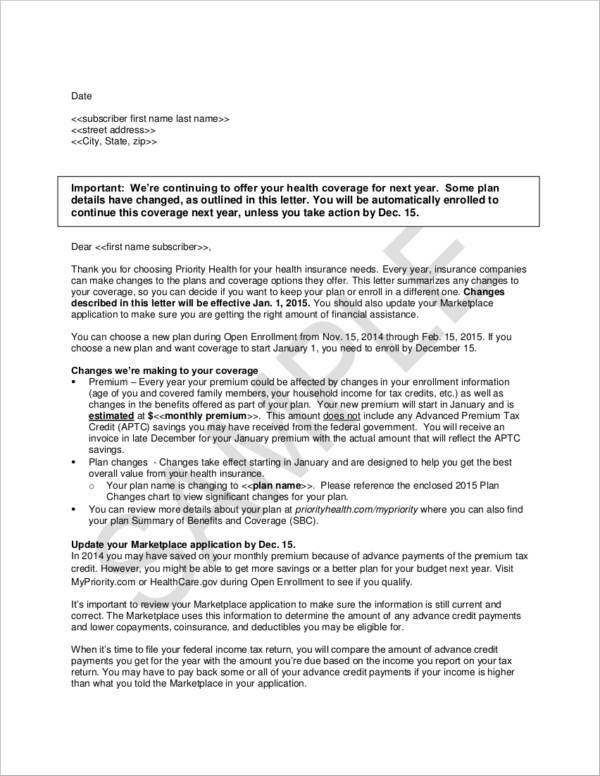 Notices are not only limited to renewals. 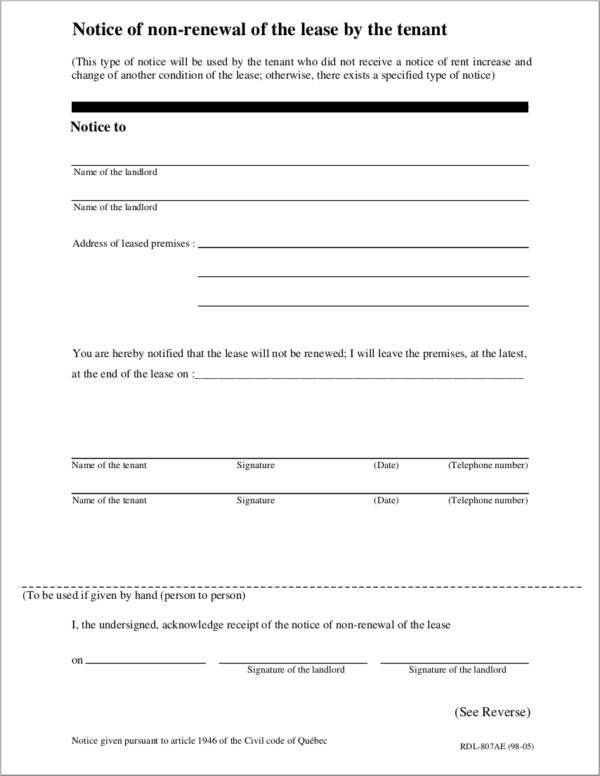 There are also other notices such as a 30-day notice, a tenancy notice, and printable notice forms that are used for different purposes. What Are the Things That Need to Be Renewed? If you think about it, you’ll be amazed at how many things need to be renewed. If you’re not involved in the renewal thingy or renewal business agreement, then you might not think that it is something related to you. But hey, it pays to know something about some things. Below are some of the things that are commonly renewed. How Do You Handle Renewal Notices? Some people think that you should be extra careful when handling renewal notices. This gives renewal notices a scary feel to them. This should not be because renewal notices are not awfully scary, unless it is a contract renewal notice that you are getting. Contracts have this scary factor to them if you don’t read, understand, and do your research on each part of it. This is true with renewal eviction notices. Now to avoid these scary situations or circumstances, you will need to pay attention to the renewal notice that you have received. How can you do that? Check out what we have listed below. After receiving a renewal notice, don’t put it somewhere to rot. It is best that you open and read it so that you would know what it is all about. Don’t waste your time about fearing the unknown when you can obviously open it and know what it is. Don’t just read what it is about. 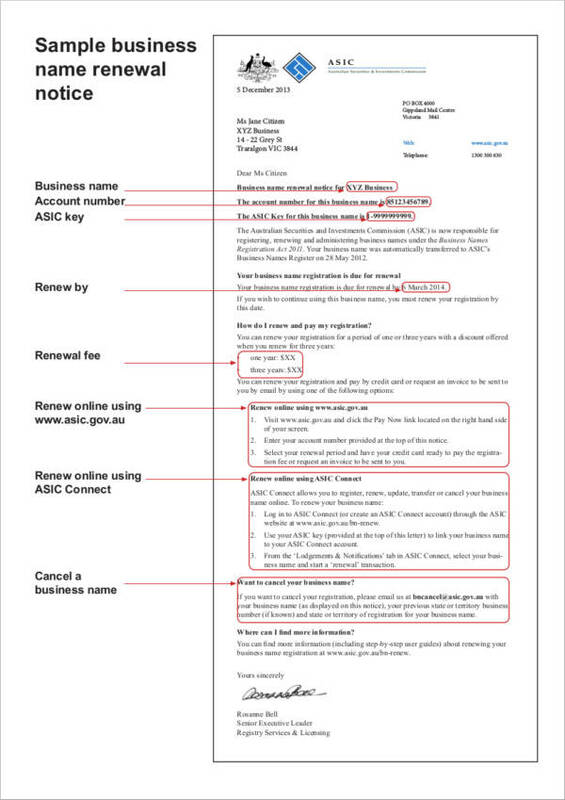 Understand its content so that you will know why you have been sent a renewal notice. Don’t just read and not understand anything. That defeats the purpose of reading. Read everything in the renewal notice as it will give you important information and detailed instructions if there is a need for you to do anything and what you need to do. You can also see Tenancy notice samples. If you need to take action, do it as soon as possible. Renewal notices include the renewal dates or a specific deadline for things that you need to do or change in it. 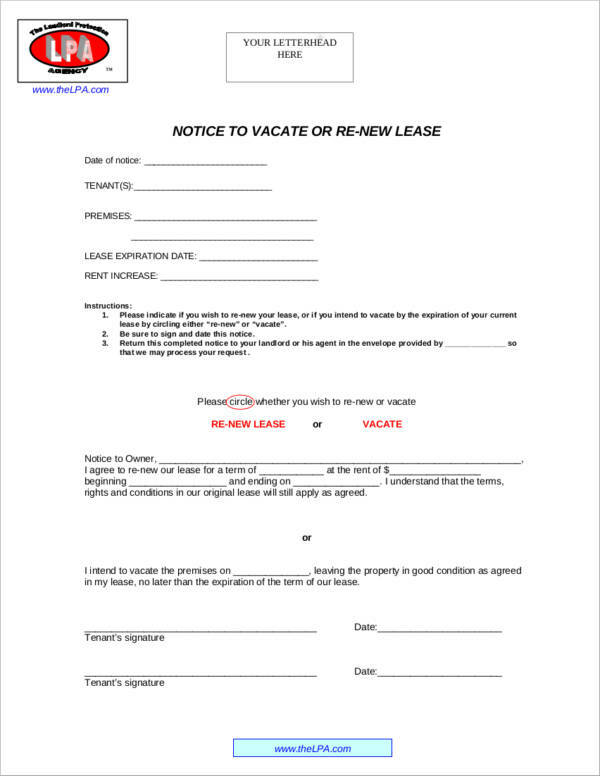 Try to take action before the date mentioned in the notice to vacate. Now if you don’t know what to do because things are a bit different and a bit complicated for you to comprehend, don’t panic. Calm down, relax, and call the hotline or customer service number of the entity or company who sent you the notice. If you can directly go to their office the better. Ask questions about the renewal notice. Ask about everything you do not understand. Do not be ashamed to ask because if you do, you lose your chance of knowing and understanding the notice. 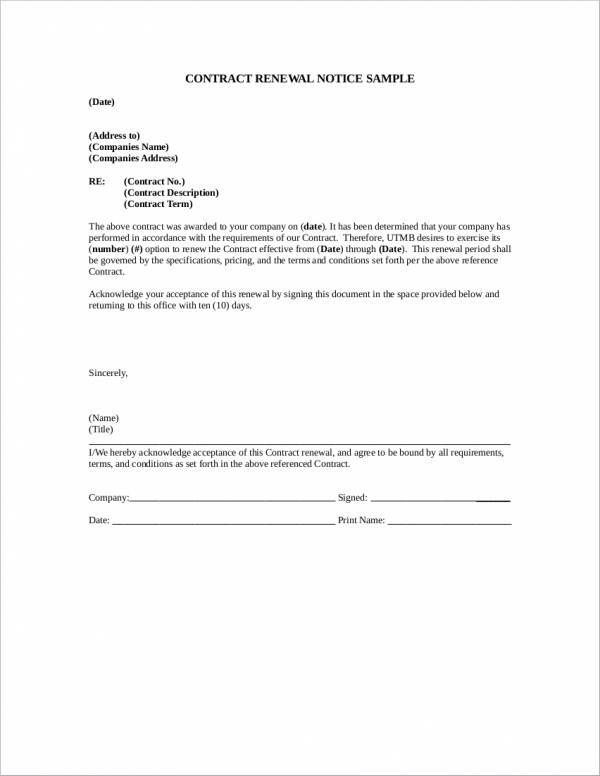 You can alos see resignation notice samples. If you still don’t get it after asking, then do your research. Try to figure things out the way you understand it. It will make things even easier for you. Once everything is settled and you clearly understand the contents of the renewal notice, check the notice letters if they need your response. If so, do give them the response they requested. If not, then you’re good to go. Sometimes specific renewal notices need to be handled differently. Check the instructions in the renewal notice or contact the entity who sent it to you. What Should You See in a Renewal Notice? Never seen a renewal notice before? For sure you have seen some now since we have attached a couple of renewal notice samples in this article. There should be enough samples here to feed your curiosity. But just so you know and if you have not noticed them yet, here are the things that you should see in a renewal notice. 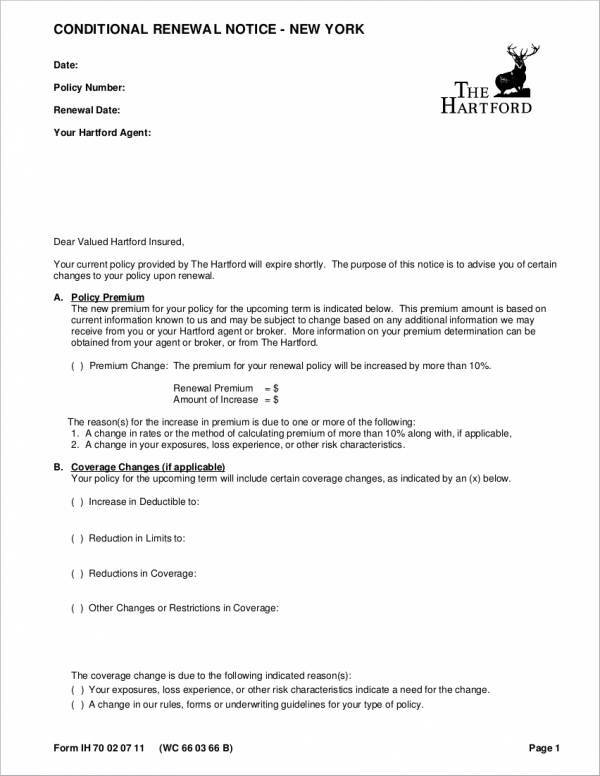 Other renewal notices may include additional information that are not mentioned above. Others may also not include some of the information mentioned above. This all depends on the type of renewal notice being sent, so it is just normal that they have some sort of differences. If you need more samples about notices, then we have a lot available for you to download. 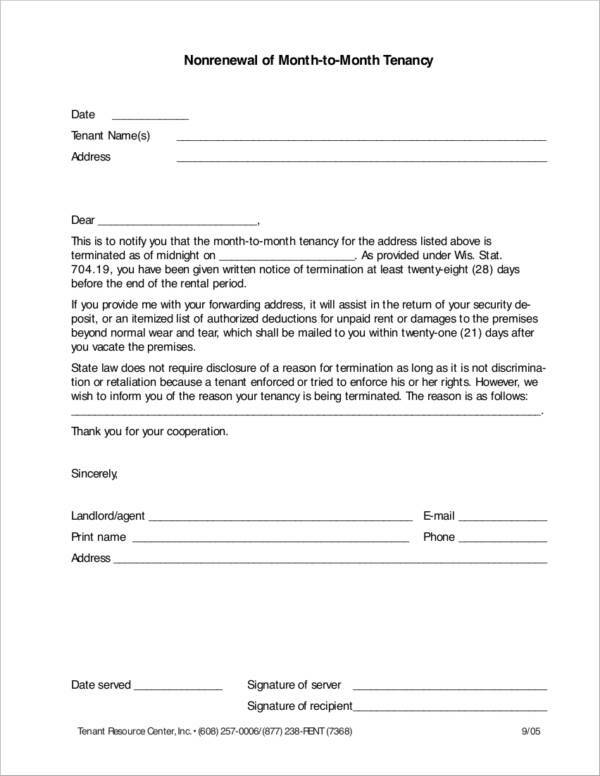 We have printable eviction notices, notice forms in Word, and termination notices to name a few. You can choose from a variety of notice samples and notice templates. A lot of these samples and templates are up for grabs for free. Check them out now!